There is an old Italian Proverb that says, “After the game, the King and the Pawn go into the same box.” This proverb teaches us, using Chess as a parallel, that God created us all as equals. No matter how important some people are in this world, how much status they have, or how much money they make, God still loves each one of us the same. When we die and return to Him who created us, we will all go to the same “box” or place to be judged. It won’t matter if we have been a King of a country, the Queen of Sheba, or a lowly pawn in the eyes of the world who spent a lifetime laboring in the most menial of tasks. In our temples, covenants are made between us and the Lord to consecrate our lives to the building up of the kingdom. 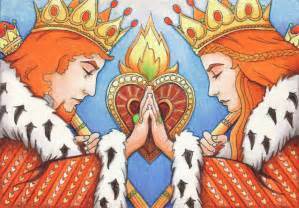 In return the Lord covenants to make us Kings and Queens unto Him. In other words, even though we are seen as a “pawn” to men here on earth, our destiny can be one of “changing” from a pawn to a King or Queen. It is a glorious doctrine that should give hope and comfort to anyone who will exercise their faith in the Lord Jesus Christ. I join President Uchtdorf in declaring that our journey here on earth can ultimately end in a divine coronation. Indeed, our destiny is to become Kings and Queens unto the most high!